Christening cake with a history. In a previous life it was a tier in our wedding cake. 3 years on it’s had a make over and tasted great! As you may recall I got a bit carried away when baking our 5 tier fruit cake for our wedding almost 3 years ago. I ended up baking 8 cakes in total (!) We managed to eat most of the cakes but had one 7 inch round cake left. So I carefully wrapped the cake in greaseproof paper and tin foil and popped it in a biscuit tin and put it in the back of the cupboard and forgot about it. It managed to survive our house move and kitchen renovations too! The original 3 year old wedding cake, full of booze and deeper in flavour and colour. It’s a well known English tradition that you save the top tier of your wedding cake for the christening of your first child. Fruit cake keeps extremely well, provided you give it a good drink of booze every now and then. It also needs to be kept in a dry cool environment. It’s important to store it in a tin, not a plastic container, as the cake will sweat in plastic. And sweat means mould which you really don’t want! A layer of greaseproof paper and tin foil helps to stop the cake from drying out and keep the booze, which preserves the cake, in. Every time I moved the cake (about once a year) I had a quick peek in the foil and topped it up with the orange brandy liqueur that I used in our original wedding cake. Drizzling just enough booze over the top of the cake to make it slightly damp (about 2-3 tbs). After 2 years I replaced the paper and foil. I was a bit nervous about feeding a 3 year old fruit cake to my family but on close inspection the cake looked absolutely perfect just much darker than when I first baked it from absorbing all that delicious brandy. I had such high ambitions and a million ideas on how to decorate the cake but with very limited time and a 5 month old baby who needs feeding every hour or so my ability to make fondant hot air balloons and elephants totally escaped me. And to be honest sugar craft has never been my strong point! I gave up sugar crafting and instead ate a lump of marzipan with a cup of tea. As a compromise I opted for the smoothest finish I could manage of white fondant with duck egg blue polka dot design (much simpler and quicker!) And a year later I realise I’ve clearly got an unhealthy obsession with duck egg blue polka dots as I’ve just decorated the little one’s room in them too! And don’t tell anyone but I cheated and bought a polystyrene 6 inch round to decorate for the top tier to give extra height and interest! As I was baking loads of chocolate cupcakes, flapjacks and brownies for my non fruit cake loving nieces and nephews I didn’t want to bake another round cake to ice as sponge cake can’t be iced a month in advance! I iced the fruit and fake cakes a month in advance to give it a chance to dry and set. Making the cakes more durable and easy to transport. I iced them directly onto half inch thick drum cake boards for extra height with a layer of marzipan and fondant. To hide any rough edges I pinned white ribbon into the drum boards around the edge of the cake. And found some beautiful grey polka dot ribbon that my friend gave me which worked perfectly to make a decorative bow on the top tier. As the cakes were on their drum boards I used dress making pins rubbed with brandy to pin the ribbon directly into the board without fear of the pins rusting. Once the cakes were iced, buffed and smoothed (method here) I dabbed the small fondant polka dots (cut out with the round end of a fine piping nozzle) with a spot of brandy to help it adhere to the fondant. I stored the cakes in cardboard cake boxes to protect them and help them dry and then all I had to do was make the bunting cake topper using some glitter sticker letters and paint my cardboard letters. So you definitely know our little one’s name! I was so impressed with the cake. It actually tastes better than I remember. 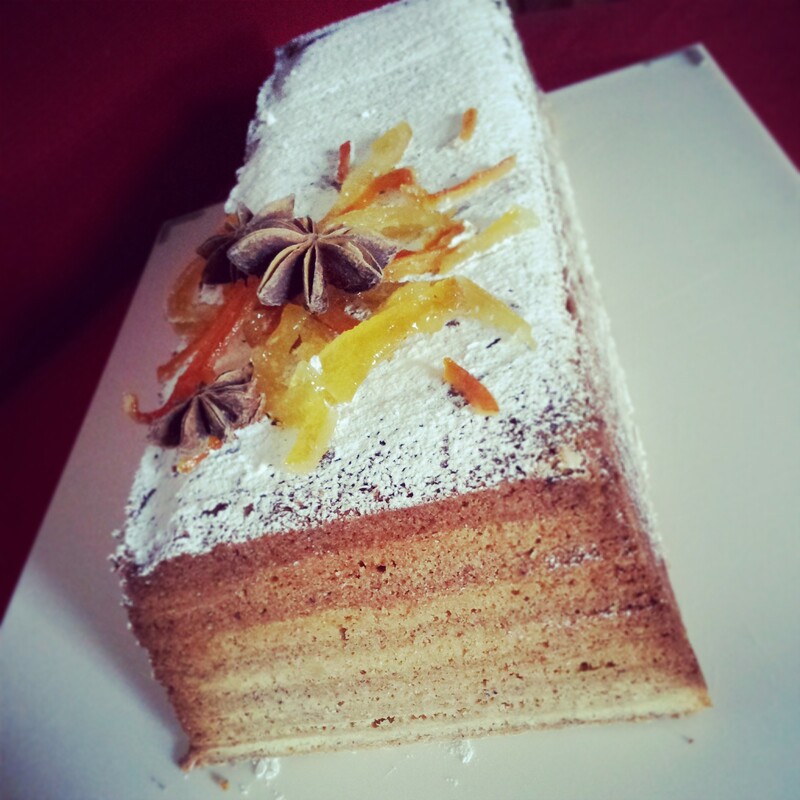 The orange brandy really popped and had intensified throughout the cake which was moist and rich. Fruit cake definitely gets better as it ages. The more mature the better. I’m so pleased I saved the cake. Not only did it save me from having to bake one whilst clutching a small baby but I managed to slice it into half inch fingers and feed our 50 family members and keep a couple of pieces for me to enjoy and savour later on! Traditional, tasty and time saving. What’s not to love? I’ve had my eye on this gorgeous Indonesian Thousand Layer Cake (Spekkoek) for quite some time. With it’s perfectly symmetrical stripes of spice interwoven with ribbons of vanilla. Spekkoek or lapis legit is a rich layered cake and is very expensive to buy due to the amount of time it takes to create it, so it’s normally eaten at special occasions and celebrations such as Christmas, weddings or festivals in Indonesian. It requires a bit of planning and preparation and a lot of hitting the pause button if you choose to watch a film whilst trying to bake it, as each layer is baked individually for 11 minutes precisely. But it’s well worth the effort. 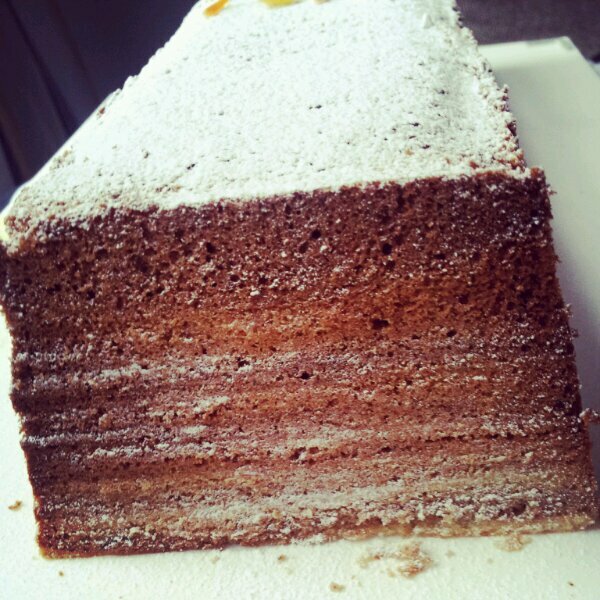 Most recipes for a Thousand Layer cake ask for up to 30 eggs! I thought this was a bit extreme and not the most healthy of cakes so scaled it back to a mere 10 eggs. Much more affordable too. It’s definitely a special cake lavished with lots of love and attention it had to taste wonderful. You own an electric whisk – this would be quite an ordeal to whisk by hand! You add lots of spice! I’m lucky that I own a Kitchenaid and it could take the strain of whisking the egg whites for me whilst I busied myself whisking the yolks. But you could do it in 3 separate stages if you like. You don’t have to multi task to the extreme if you don’t want to. Me, I enjoy adding a bit of danger to my bakes. Doing everything at once. I’ll balance my bowls on top of many ingredients on the work surfaces and hope for the best, like spinning plates, but in my case it’s batter. 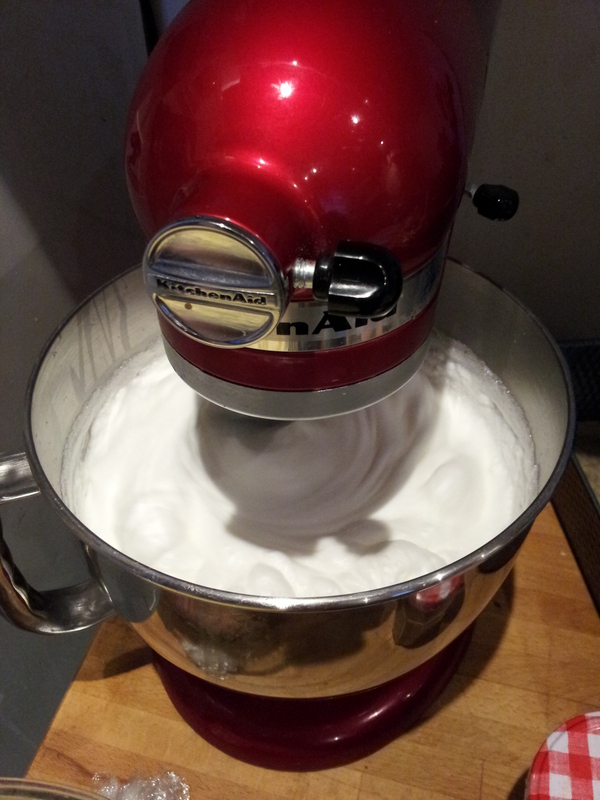 Whilst whisking the egg whites with about 100g of the sugar with a hand held electric whisk I set the Kitchenaid away to whisk the egg whites until fluffy. Once the whites start to stiffen add 100g of sugar (bit by bit) and continue to whisk until they reach stiff peaks and look glossy. Then as if you’re not busy enough, beat together the remaining sugar, with the butter and vanilla extract until light and fluffy. You’re going to need the biggest bowl that you own to incorporate all of the ingredients together. 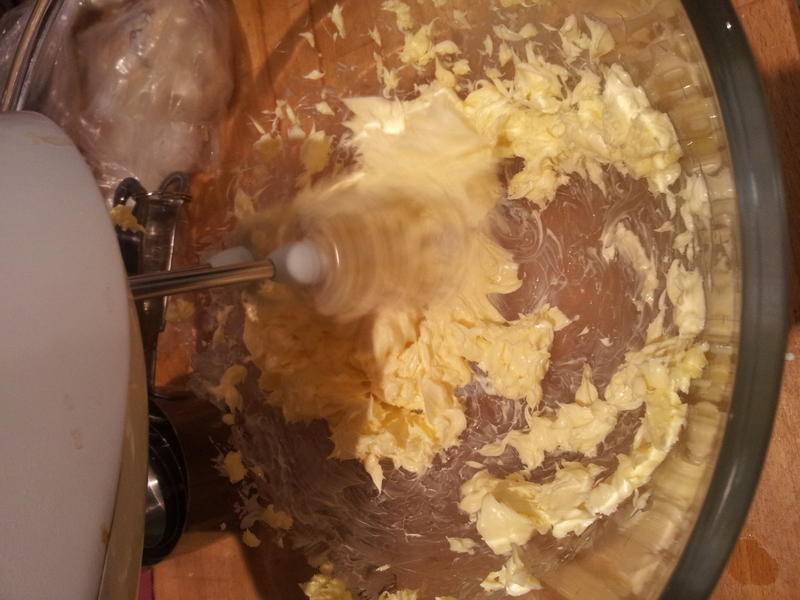 Start with mixing the egg yolk batter and the butter/sugar paste together. 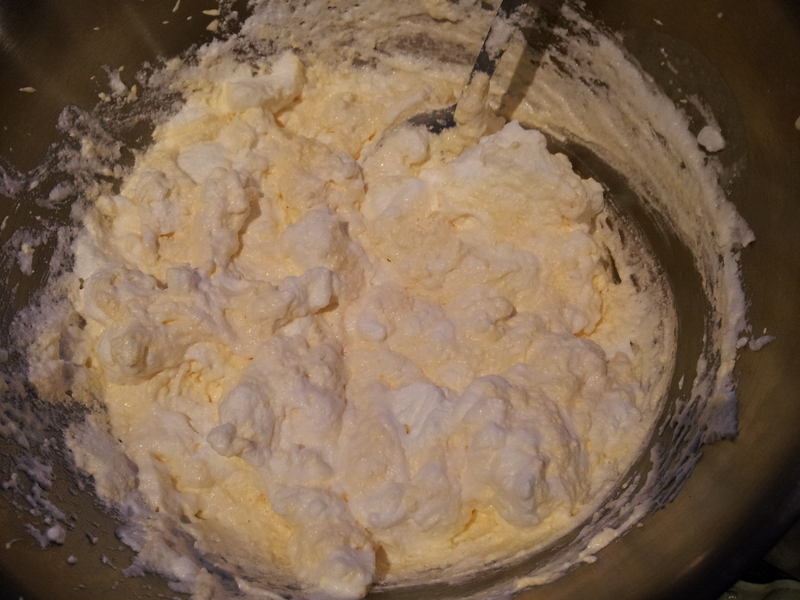 Once all of the ingredients are mixed well (I used my electric hand whisk) the delicate process of folding in the egg whites to the batter can begin. 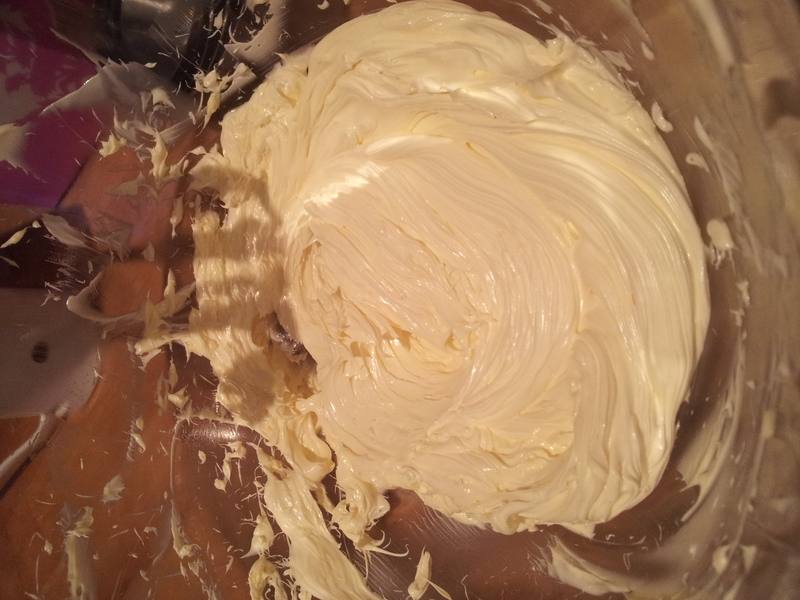 Using a metal spoon fold in gently the egg whites to preserve the air in the batter. There’s a lot of egg whites to fold in! 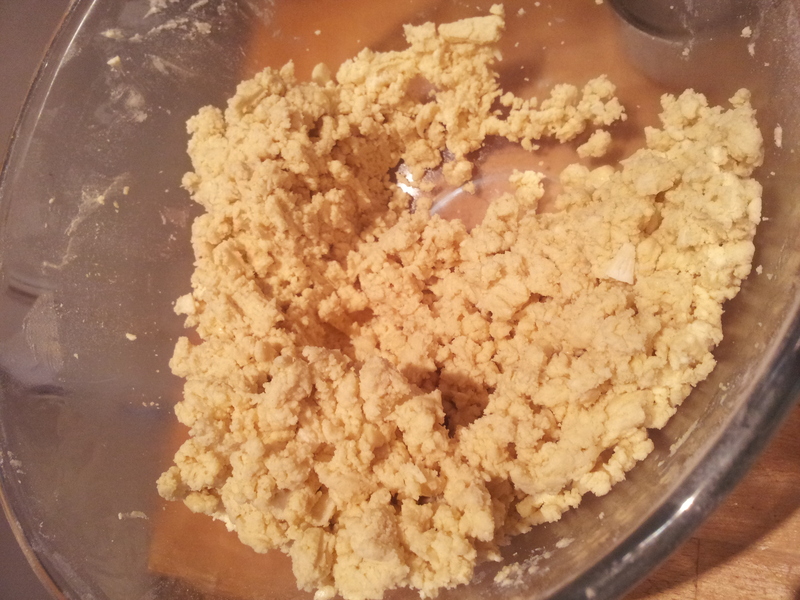 It will start to look like scrambled eggs but persevere until the batter looks smooth. 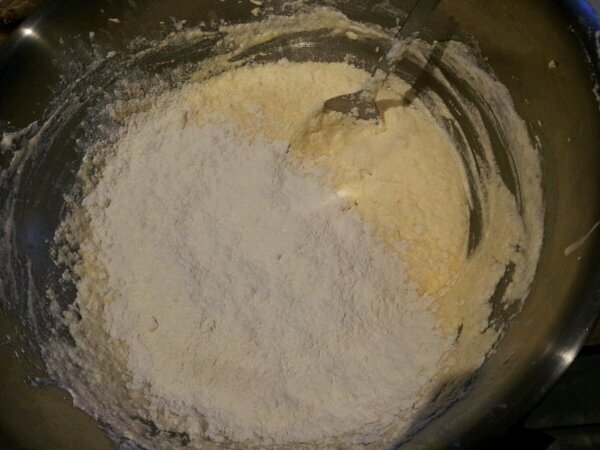 Next up is the relatively small amount of plain flour considering how much egg and butter is in this cake! 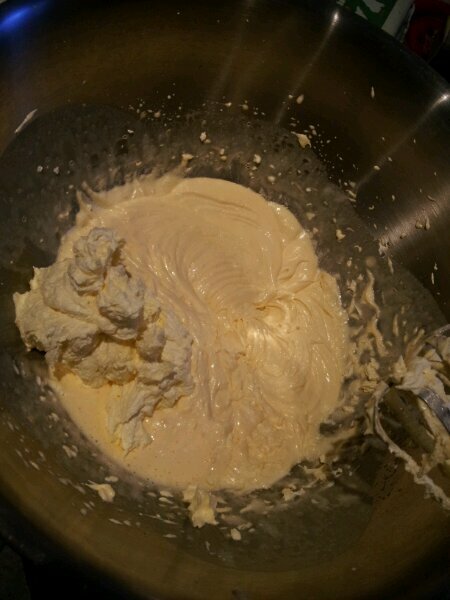 It also needs to be folded in carefully to the batter with a metal spoon. 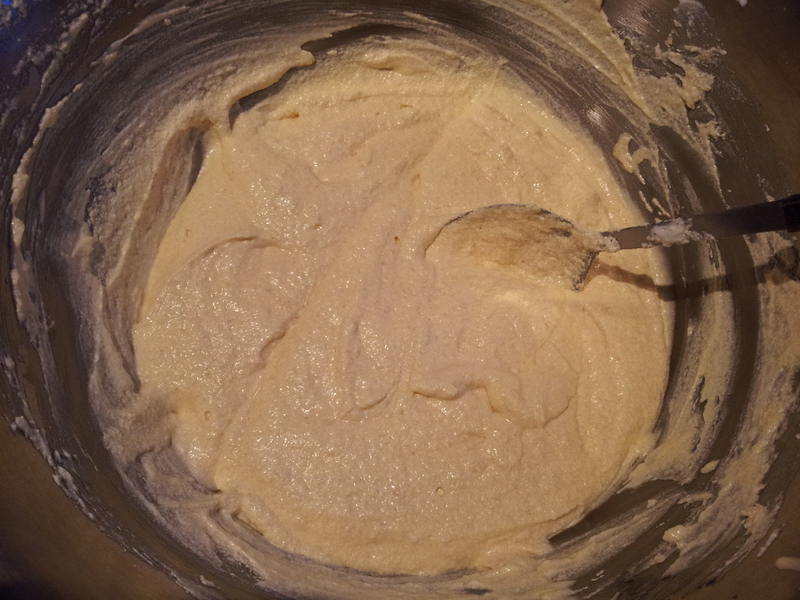 To achieve the two tone and two flavour effect half of the batter needs to be flavoured with spices and the other half left to be as it is, with a hint of vanilla. Split the batter in half (you’re going to need yet another bowl here!) 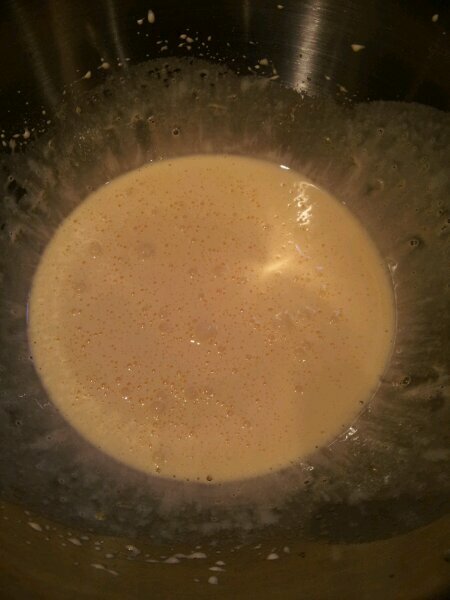 and fold the spices into half of the batter. 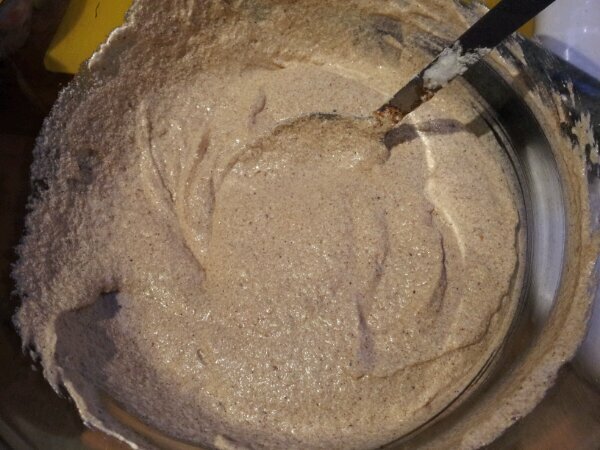 The spiced batter should look slightly browner in colour. this will help you to remember which layer you’re up to when it comes to cooking the cake! 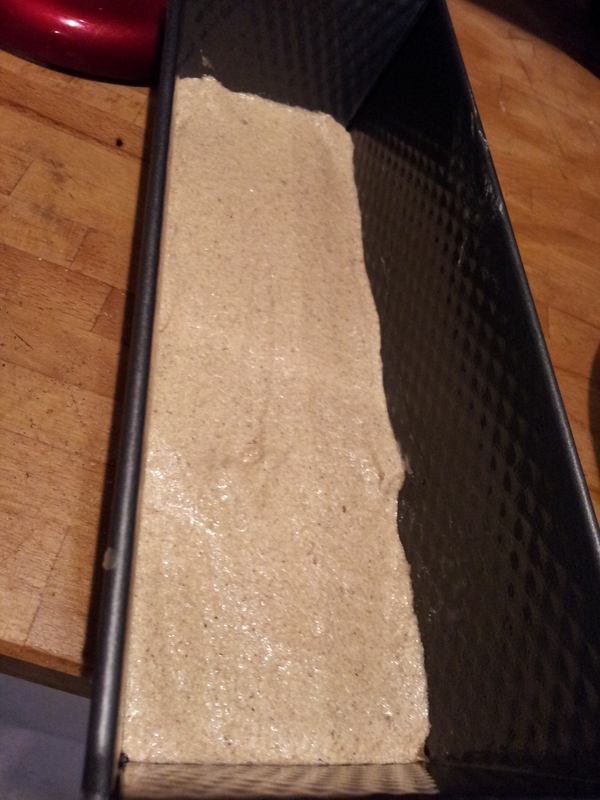 With your two bowls of batter ready, it’s time to spoon a thin layer (about 5mm) into greased and lined baking tin. 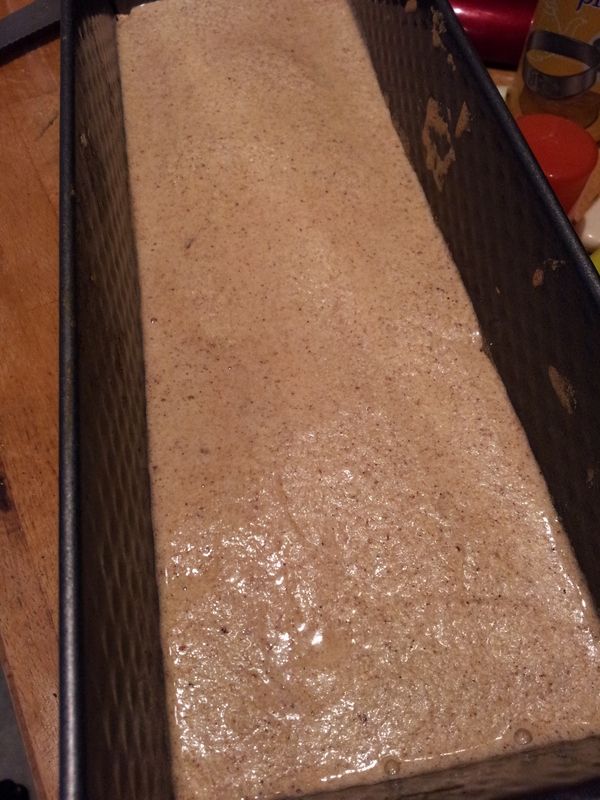 I used my new extra long German loaf tin 30cm x 10cm. Make sure you push the batter into all of the corners and smooth it down. Give it a very gentle tap on the worksurface to remove any air bubbles and pop it in the oven for 11 minutes. Some recipes say to follow this bake with a minute under the grill, however my oven doesn’t have a separate grill and oven. The grill would have to be warmed up each time which to me seemed a bit too laborious. Instead I added an extra minute to the baking time to compensate for the lack of grilling and it worked a treat. 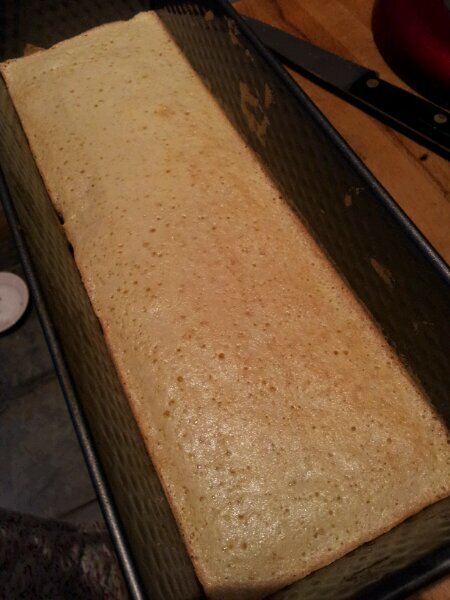 It’s a bit tricky to get the first layer into all of the corners as the batter is quite stiff. I wiped the inside edges of the tin round with a clean finger to remove any extra batter to avoid any smudging of the layers later on. 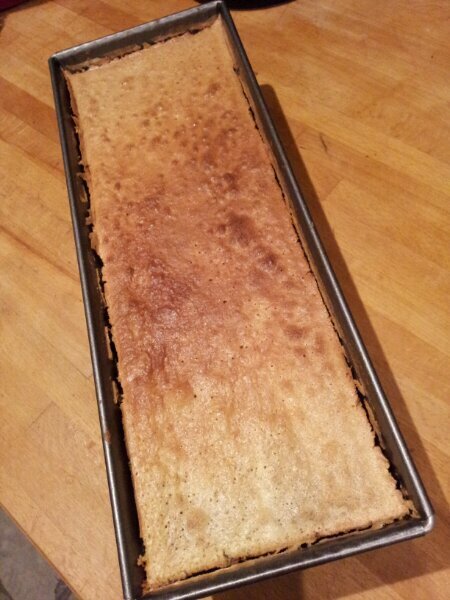 The last thing you want is a smear of burnt batter up the sides your beautiful layer cake. After 11 minutes in the oven the first layer should be slightly golden brown and evenly baked. Ready for the addition of the next layer straight on top of the hot cake. 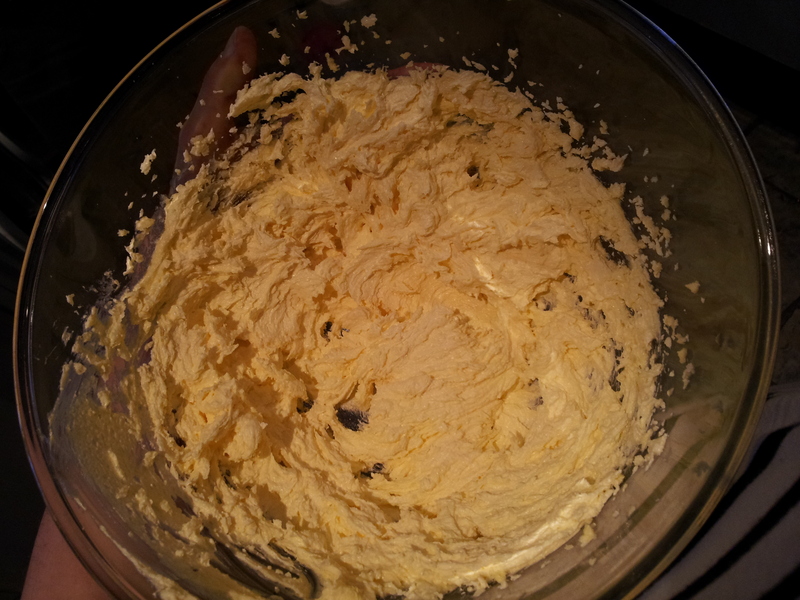 The heat from the first layer helps to melt the butter and spread the batter evenly around the tin. Remember to alternate your batters! One layer vanilla, one layer spice and repeat. As your cake bakes it will probably shrink back from the sides of the tin a little, so don’t be alarmed if some of the raw batter disappears down the sides of the cake and into the layer below. A liberal dusting of icing sugar hides all manner of mishaps to a finished cake! Keep alternating the batters. 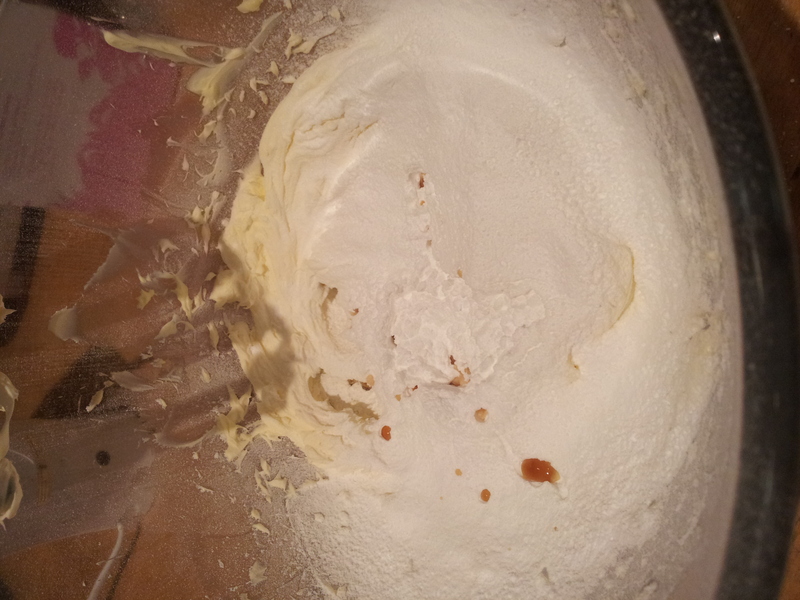 Repeating the layering, spreading, baking and even more layering until you’ve no more batter left. This process is not for the time restricted or feint hearted. Baking the cake took at least 4 hours, but it’s almost like a work out, leaping up off the sofa to take the cake out of the oven every 11 minutes. 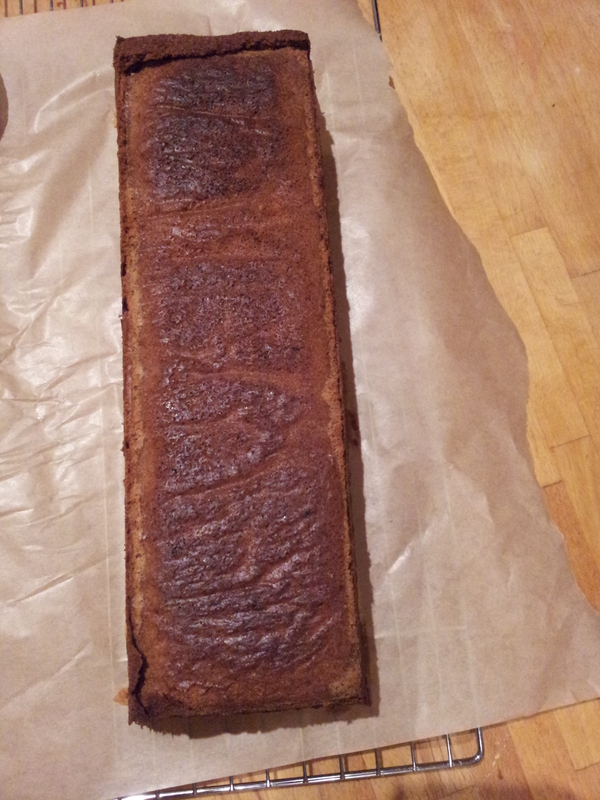 I grilled the final layer a bit for extra authenticity… It looks a bit burnt but tasted good! Let the cake cool in the tin for about 2o minutes before gently loosening the cake from the tin with a palette knife and attempting to remove it from the tin. I grilled the final layer a bit for extra authenticity… It looks a bit burnt but tasted good! I must admit I was a tad alarmed at how dark the cake was when I removed it from the tin. I did wonder how the initial layers would hold up after being baked time and time again. Would they be burnt and tough? I baked at least 18 layers into my cake, that’s a whole lot of oven time for the first few cms of the cake. 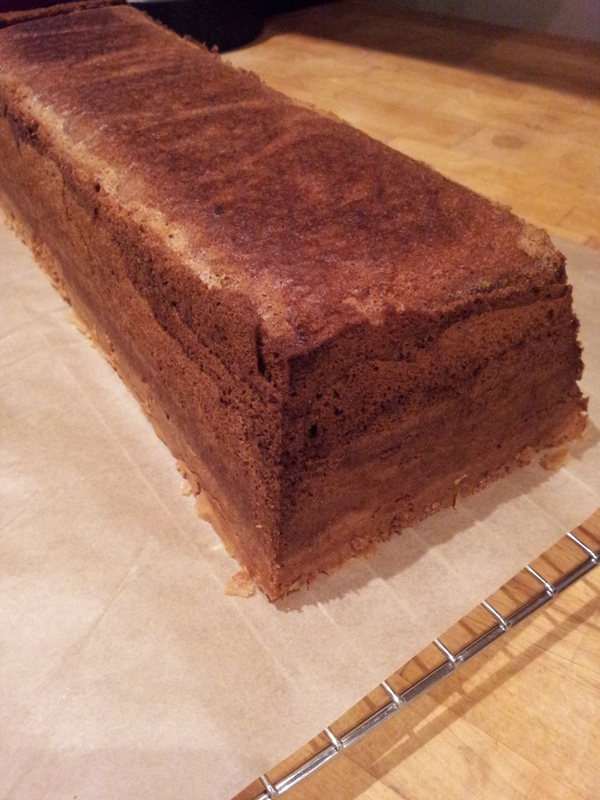 The white icing sugar gave the layers an extra lift against the contrasting spice. I baked my Indonesian Thousand Layer Cake for a special Clandestine Cake Club ‘Here comes the sun’ themed event. I was hurrying along to the cakey gathering but just had enough time to slice up some homemade candied orange and lemon citrus peel (Thank you Sharyn at The Kale Chronicles for the how to!) 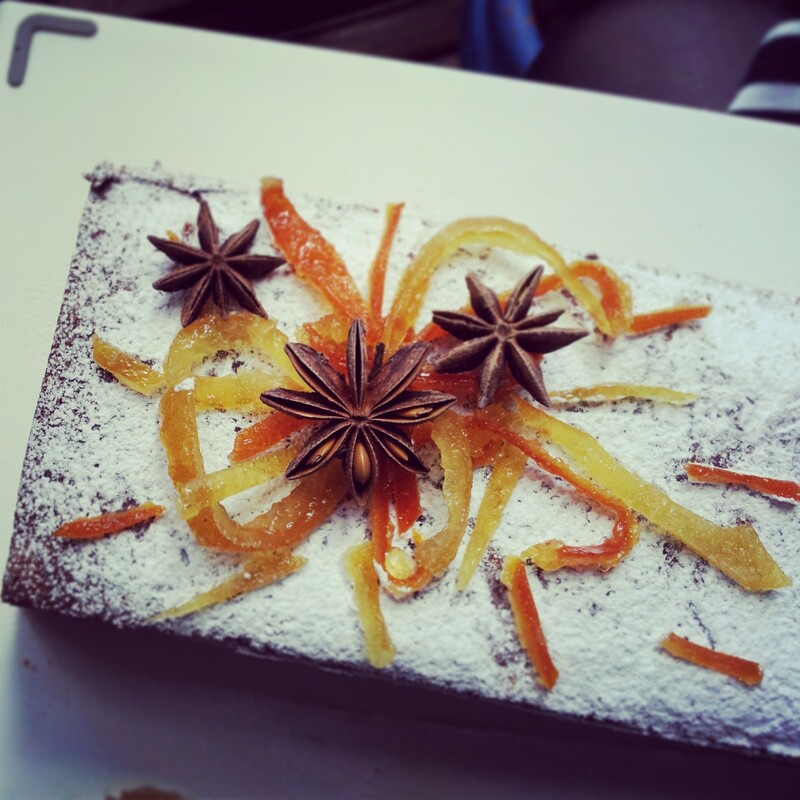 in long thin strips to create my very own sunburst effect, adding a trio of star anise (one of the key spices in the cake) to bring the summery spicey cake to life. As Mary Berry always says, you should include a bit of what’s inside the cake, outside the cake to whet people’s appetites. As the tin that I used is supposed to be for bread, I don’t own a cake stand or plate big enough to house such a lengthy cake. I resorted to carrying the cake ,open topped on a chopping board instead. Note to self, icing sugar sitting on a cake will not stay there for long on a windy day. Precariously seated on my passenger seat and me also liberally coated in icing sugar we made our way to the Clandestine Cake Club! I’m so pleased I took the time to attempt the Indonesian Thousand Layer Cake cake although technically not exactly 1000 layers it feels close enough! A challenge of the patience and my washing up ability it may be but this cake promises so much more than a frustrating time in the kitchen. 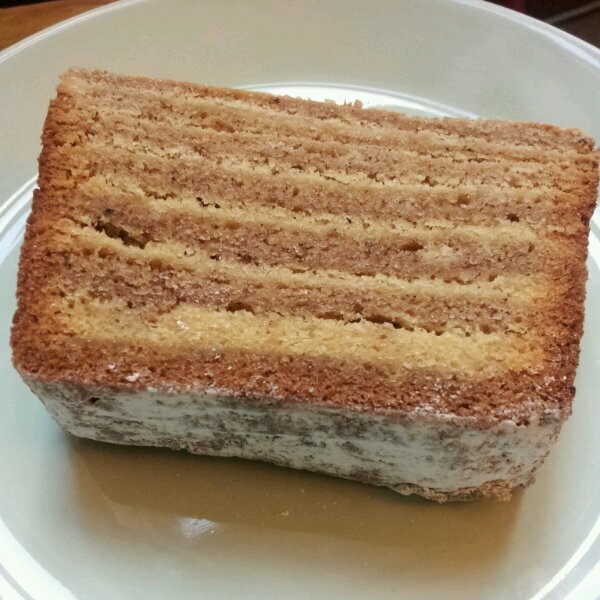 It is such an unusual tasting cake, quite delicate and surprisingly light, I guess due to the sparse amount of flour and the endless whisking. This cake is magic. There must be something in the enormous amounts of eggs that go into the batter that prevent the layers from burning or drying up to a miserable shrivelled mess. It’s moist, spicy and sweet, although not too sweet. It’s a proper grown up cake, sophisticated in it’s beautiful layers and exotic taste. It also improves with age. I had half a piece left from the Cake Club which I shared with Chris 4 days after baking it and it was delicious not dry in the slightest. 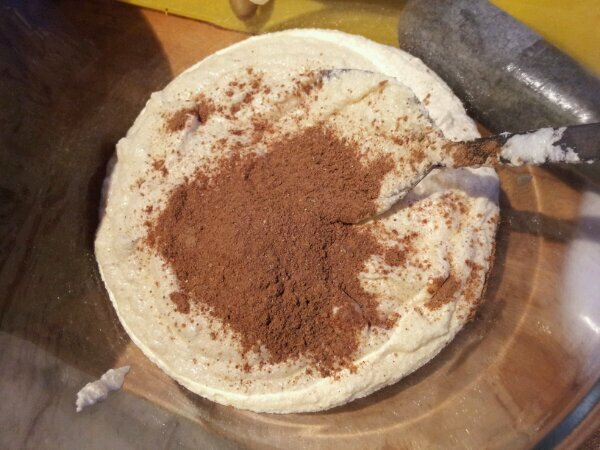 I think spice cake always deepens in flavour with time. If you want to savour the cake you can even peel each individual layer and eat them separately. I enjoyed devouring it with a strong coffee. I will be baking this again when I have an afternoon to spare and maybe attempting more stripey cakes in the future. I think I’m hooked! Bake for 11 minutes at 160 degrees C.
Repeat alternating the batters until all the batter is cooked. Cool, remove from tin, decorate and eat! You may realise by now that I LOVE Lamingtons. They are definitely one of my Australian highlights, alongside the cake shops in St Kilda and the koalas hanging out in eucalyptus trees. It’s been a while since I baked any of these sweet treats and I must apologise it’s been quite some time since I wrote. It’s been a bit hectic what with getting married having a last minute trip to Berlin and oh yes fitting in the proper job too… I promise I will get back to some international baking VERY soon (and also share with you the photos of my wedding cake too!). 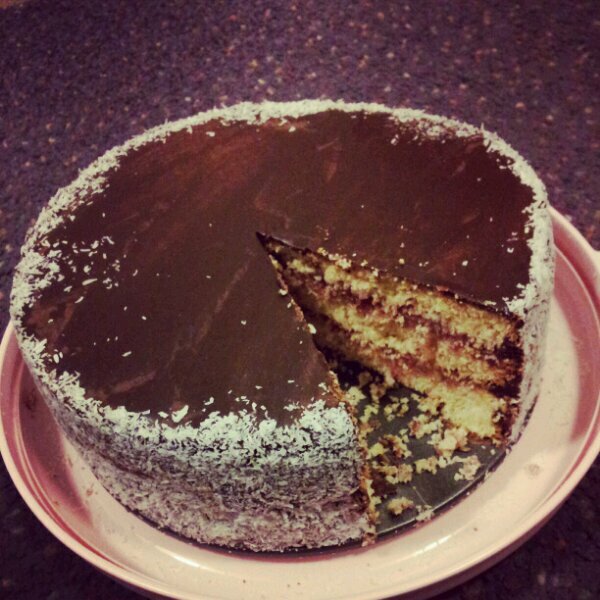 In the meantime I wanted to share with you an experimental Layered Lamington Cake that I made up the other day. I had promised Chris a tiered Lamington Cake for the wedding. Something that I had imagined in my mind but frankly in amongst baking and icing 5 layers of fruit cake, making 150 sugar flowers, our house flooding 2 weeks before the wedding and baking brownies and Lavender meringues I never had the opportunity to bring to life. Until now. So here it is! A slightly smaller scale Layered Lamington Wedding Cake for Chris. Next time I will bake 2 more smaller cakes and stack them one on top of the other… for a tower of layered Lamington! I wanted to make a more grown up version of the Lamington. More luxurious, decadent and slightly prettier than the Lamington bricks that I’ve made previously. 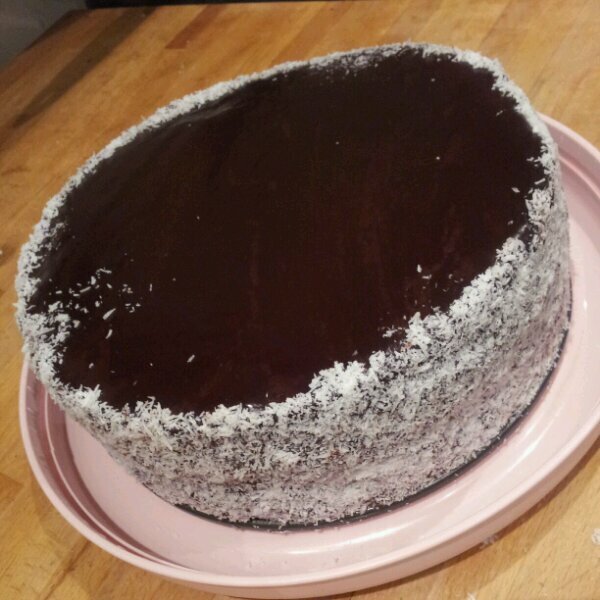 To produce this I incorporated the coconut into the sponge, which meant I could keep the top of the cake coconut free to showcase the shiny chocolate ganache, whilst preserving the coconut and chocolate Lamington tradition. I double coated the cake in chocolate soup sauce first before a double chocolate ganache layer to increase the luxuriousness of the Lamington. And then to add an extra level of height and flavour why not add a third layer of sponge, one more than your traditional Lamington sandwich. It’s an extremely indulgent cake. One to be enjoyed on a special occasion perhaps. It takes a bit of organising and assembling, but I can assure you it’s worth the effort! Chris definitely enjoyed it and so did my friends. If you fancy having a go I’ve included the instructions below. As the cake is entirely encased in chocolate and contains a double layer of jam it’s a light and moist sponge. I’m hungry just reminiscing about it now! Hope you enjoy it as much as me. 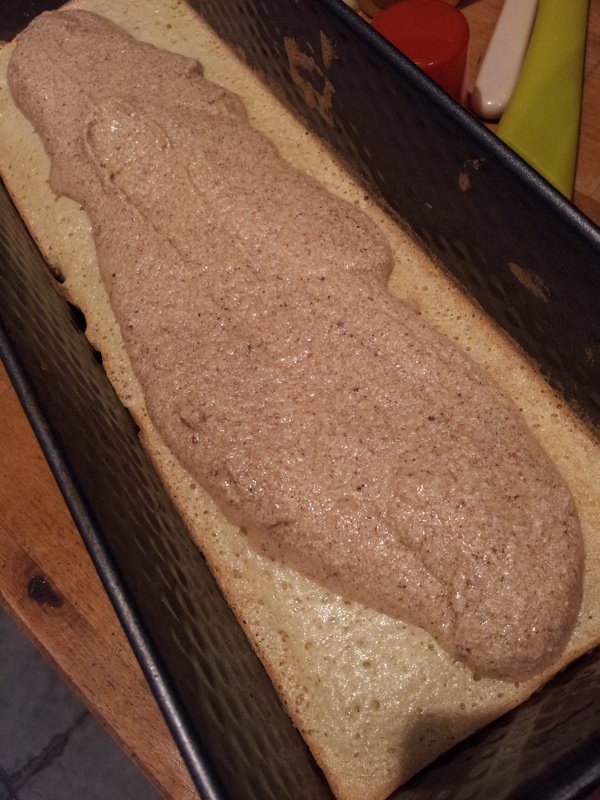 Give it a few minutes to ‘set slightly’ then flip over the sponge so the chocolate is face down on your cake plate. Spoon half the jar of strawberry jam onto the sponge and spread evenly. Place the other half of the sponge cake on top of the jam and press gently. Pour the hot chocolate ganache all over the cake and sides. Ensure you have a smooth and shiny coat by tilting the cake to run the ganache down the sides, use a palette knife if necessary to sharpen the edges of the cake. Repeat ganache layer again to double coat the cake. Allow the ganache to set at room temperature to maintain the high gloss finish and serve in huge chunks with a bucket of tea. I’ve had Polvorón on my mind for some time. I read about these crunchy little biscuits bites, months and months ago and they’ve been sitting patiently in my ‘Things to bake’ pile ever since. They are quite an unusual discovery, something I had never heard if before. Traditionally Polvorón are eaten as wedding cakes in Mexico made with pecans or as Christmas cakes in Spain, kind of like a Spanish Shortbread. Now I’m planning my own wedding I thought perhaps now is the time to incorporate an international flair into the festivities. Intrigued I launched into my own interpretation of the traditional recipe, basically determined by whatever ingredients I have in the cupboard. I don’t usually buy pecans or walnuts so they had to be substituted for good old almonds (a nut which is ever present in my cupboard and life…) and chunks of dried coconut roughly chopped. Due to the speedy baking that was necessary (and seems to be happening more and more often in my house) I improvised yet again. No time to assemble to food processor so I grabbed the nearest heavy item (a glass jar), threw the almonds into a sturdy sandwich bag and hammered them with the jar until they were delightfully smushed. 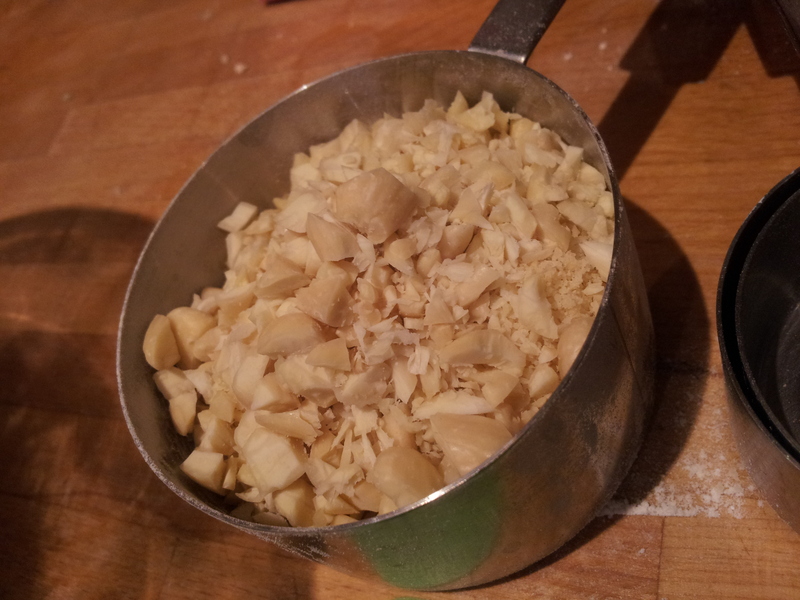 Feel free to use a pestle and mortar if you wish to be a tad more refined than I. 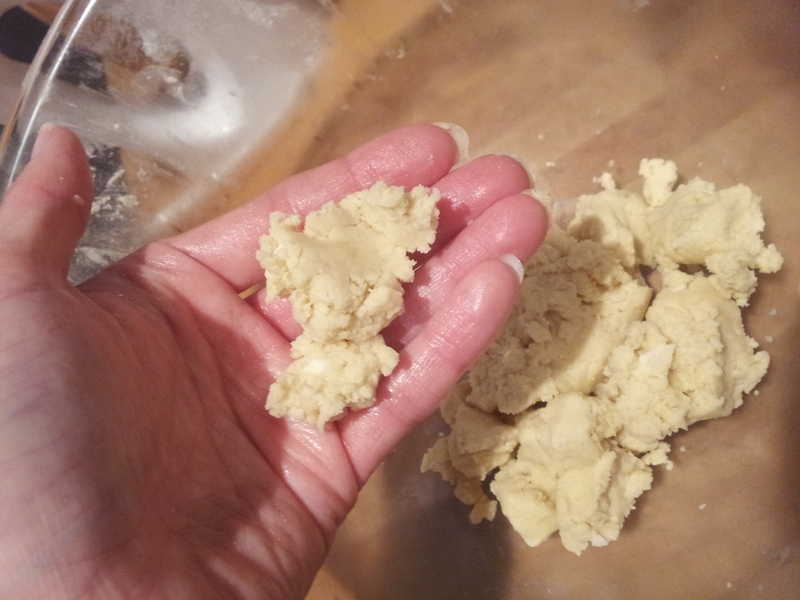 The ingredients are very similar to basic shortbread, with flour, butter and sugar. This is another brilliant biscuit for busy bakers as I managed to whip up the dough first thing on a Saturday morning, chill it whilst I showered. 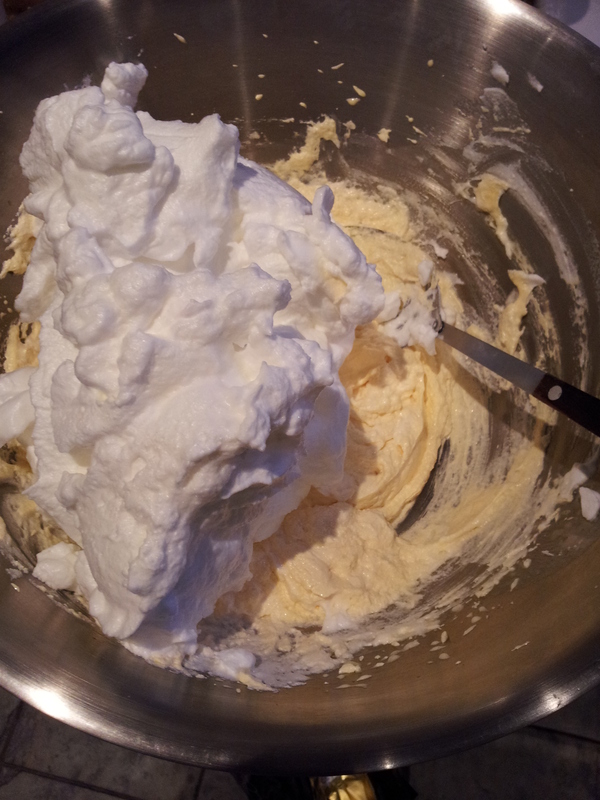 I used my trusty hand held electric whisk to beat the butter and icing (powdered) sugar together. 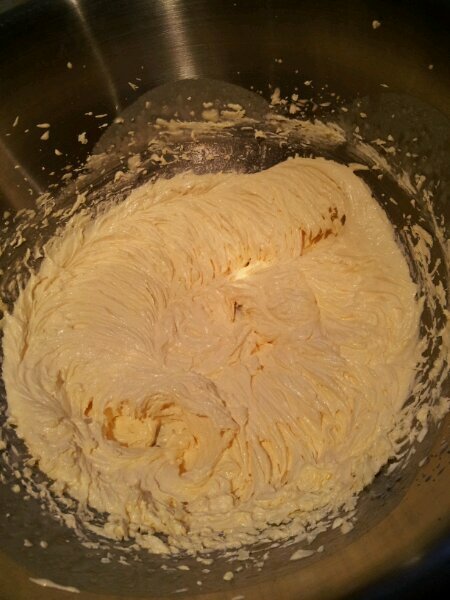 Then to whisk in the flour and vanilla extract. 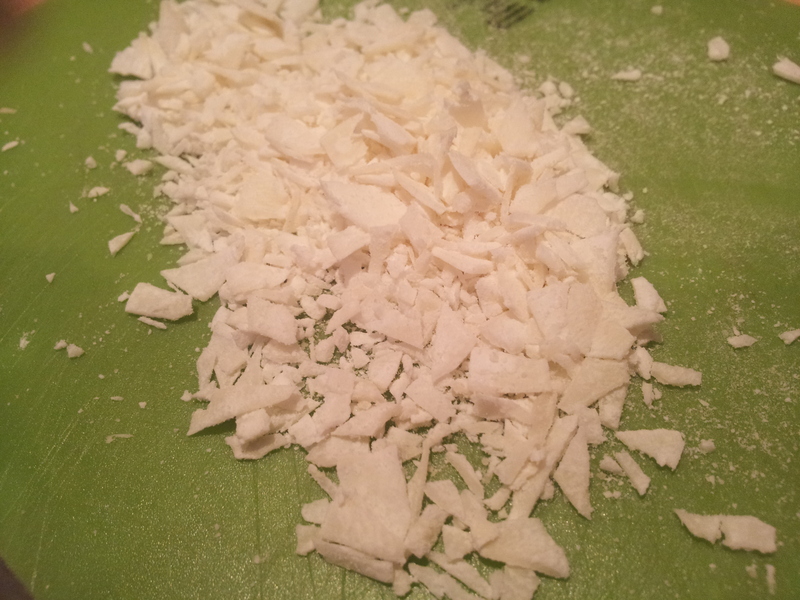 My combination of ground almonds, chopped blanched almonds and chopped coconut. And finally the nuts of your choice. I completely misunderstood the recipe which calls for the dough to be chilled. 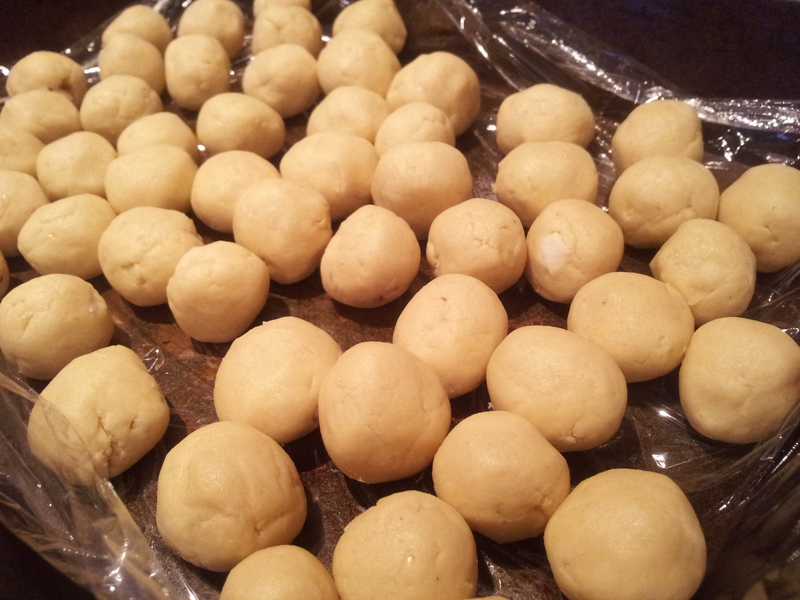 I shapped the dough by hand into about 35 mini golf balls. squash it together and hey presto you have a ball! I popped them all onto a greased and lined baking sheet covered them with cling film and popped them in the fridge to chill. 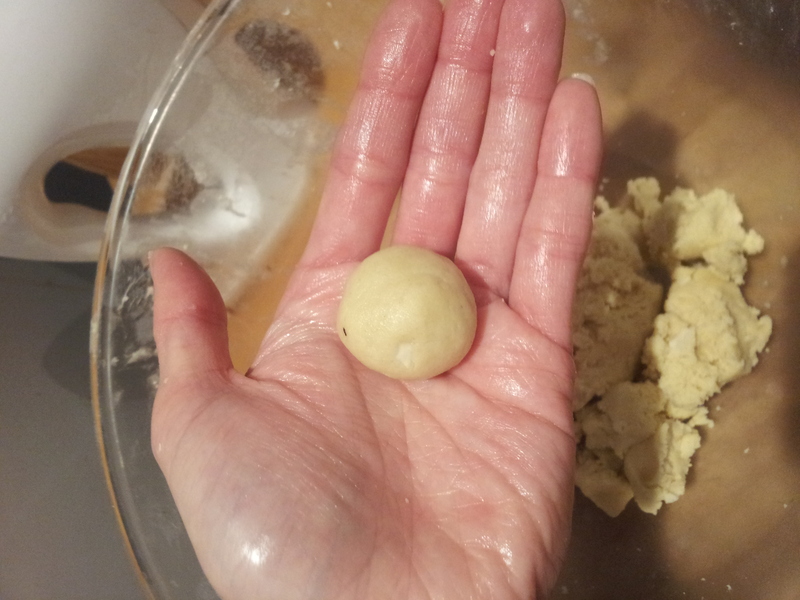 (I think you’re supposed to chill the whole dough then shape it?!) But this gave me a chance to shower so in effect helped to speed up the process. 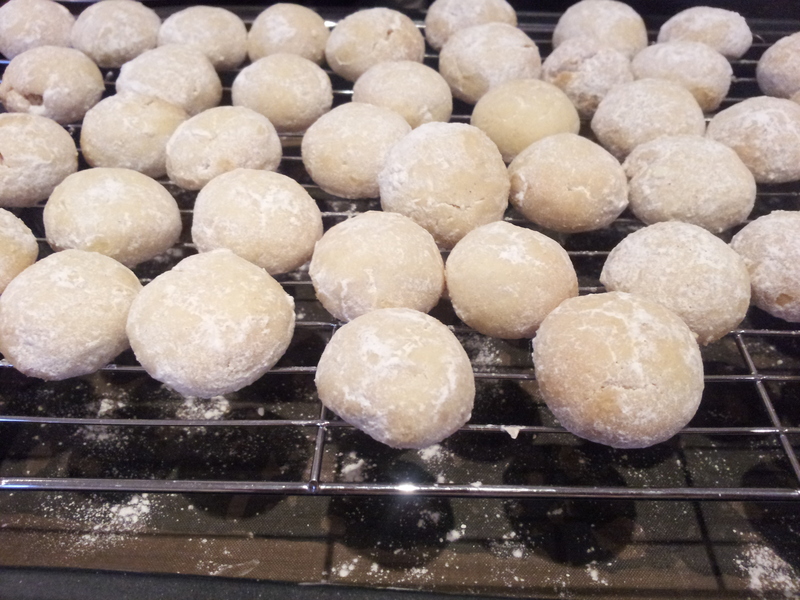 I then spaced the little balls out evenly to give them room to spread whilst they baked. I popped the tray in the oven to bake it at 170 degree C for about 18-20 minutes, until they took on a delicately golden hue, whilst I applied clothes and make up. 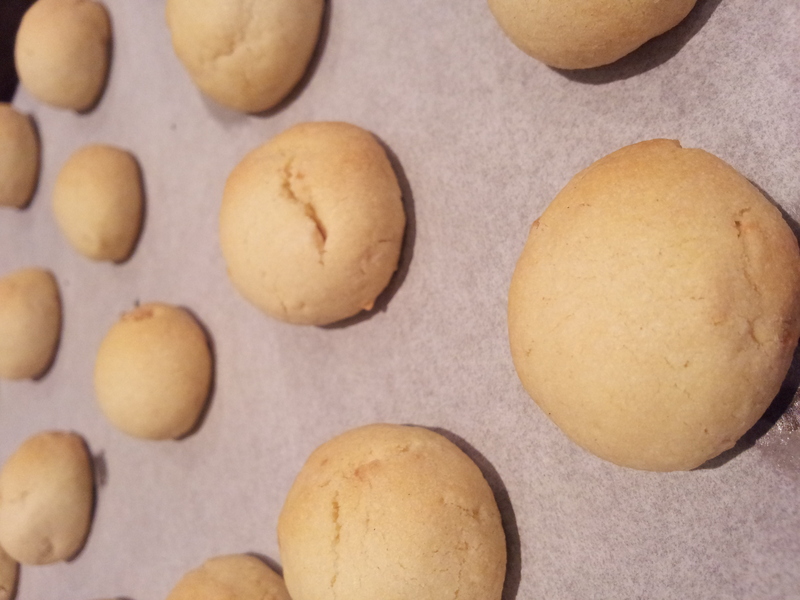 Just enough time to then allow the Polvorón to cool on the tray to set their shape for 5 minutes. Then to cool them fully on a wire rack to stop the butter sweating out of them and give them sticky bottoms. 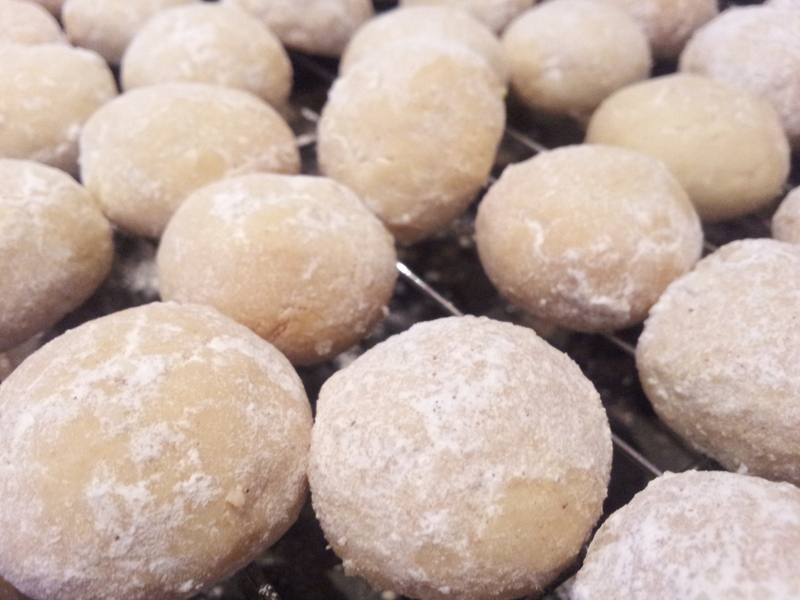 Once cooled fully I rolled the Polvorón in a bowl of icing sugar swirled with cinnamon giving them a fluffy white coat. As they set the sugar absorbed slightly into the biscuit adding an extra dimension of sweetness to the treat. I then quickly bagged them up, tied with a pretty ribbon and dashed off with my pretty packages of Polvorón to celebrate my friends birthday! With a champagne fueled (10 minute) train journey to Durham. 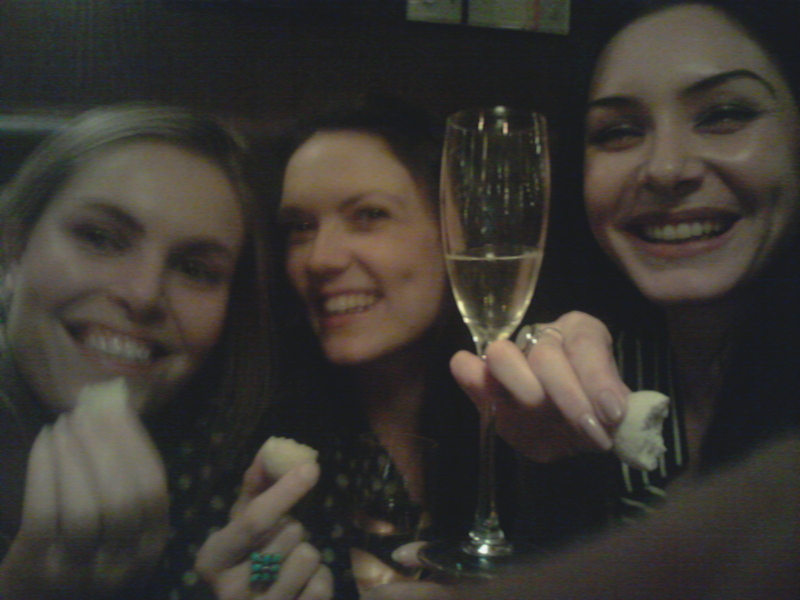 Followed by more food, cocktails and Polvorón. We declared them a tremendous cocktail accompaniment (and that’s not the frozen strawberry daiquiris talking). 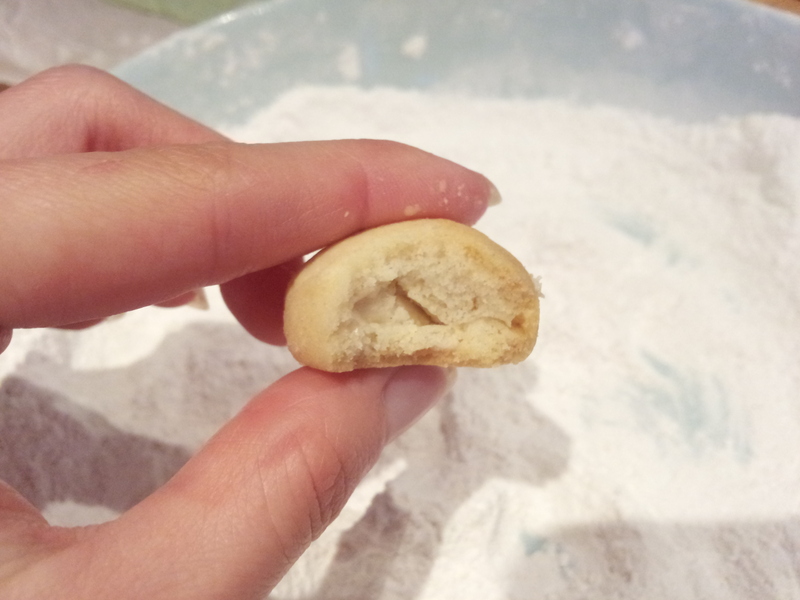 Polvorón are buttery like shortbread but with an added crunch as they are smaller and denser than a traditional shortbread biscuit. The almonds brought a subtle creamy yet crunchy texture along with the coconut. I expect pecans would add even more bite to the biscuit. 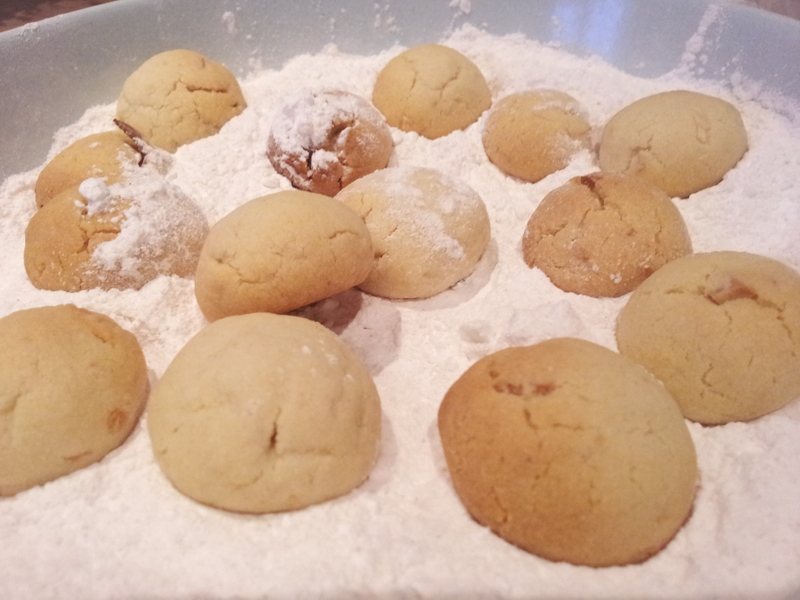 The Polvorón remind me a little of biscotti or amaretti biscuits which I also adore. What’s not to love about a delicious bite sized treat. Even better, as they’re so small you can obviously eat a whole handful of them in one go! I love the method of shaping these little biscuits into balls as I find rolling and cutting out biscuits a bit laborious I quite enjoyed this hand made alternative and I’m already inventing my own nut free recipe for my friends who can’t eat nuts as I think everyone needs a bit of Polvoron in their lives!. Thank you to Sourdoughtheangrybaker for inspiring me to bake Polvoron! I had not heard of these wonderful cakes until you told me about them. Brilliant blog if you haven’t had a look already, I recommend reading.